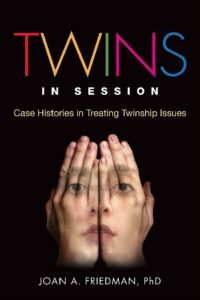 I am excited to announce that my new book, Twins in Session: Case Histories in Treating Twinship Issues, is scheduled for release on June 5, 2018. Much of the literature about twins either focuses on extreme emotional and relational abnormalities or perpetuates the stereotype of perfect synchronicity between twins. I wrote Twins in Session to share the stories of real twins who sought help for common, real-life twinship problems. I hope that these case studies will not only help other therapists better understand and treat twins but also validate twin readers’ often ambivalent feelings about their twinship and provide clarity about such a defining aspect of their identity. Our culture’s idealization of twinship and twins’ own expectations can contribute to their difficulties. Twins often are perceived as, and essentially function as, two halves of a single entity. Twins are conditioned from birth onward to expect effortless intimacy with their twin, so they often feel deeply distraught when problems arise between them. A twinship is a marriage that one does not choose, and twin pairs who have problems are very similar to couples in conflict. Therefore, twin therapy ideally helps twins recognize and accept each other as separate individuals with their own thoughts and feelings, communicate more honestly and effectively, and reestablish trust and stability. If a therapist understands the psychology of twinship and can articulate what is actually going on between the siblings, she can establish herself as a trusted outsider who can give her clients perspective about their twinship issues and assist them in developing healthier, more loving relationships. Informed by infant research and psychoanalytic developmental theory, this book offers a deeply empathic approach. The case histories highlight the depth of entanglement of the twin relationship and emphasize how important it is for the therapist to understand the nature of twin relationships. Twins in Session can be preordered now on Amazon, Barnes & Noble, and IndieBound.